I have found that embracing my husband’s passion for hunting has worked to my advantage! I’m not real fond of full trophy deer heads on the wall, accept for in designated “masculine” areas, but I do love all of the antlers that he has collected over the years. At one time, my husband had a large trappers basket packed full of antlers that he either found or had saved from his successful hunts. However, once I discovered how much I liked to decorate with them, they slowly started to disappear out of the basket. Luckily, he is happy to see them displayed just as much as I am. Although most of the antlers are displayed either on a table or wrapped around a picture frame, I came up with kind of a crazy, artsy project for one set. Because I wanted to repurpose an old seatless chair, I figured I could incorporate the antlers to decorate it. 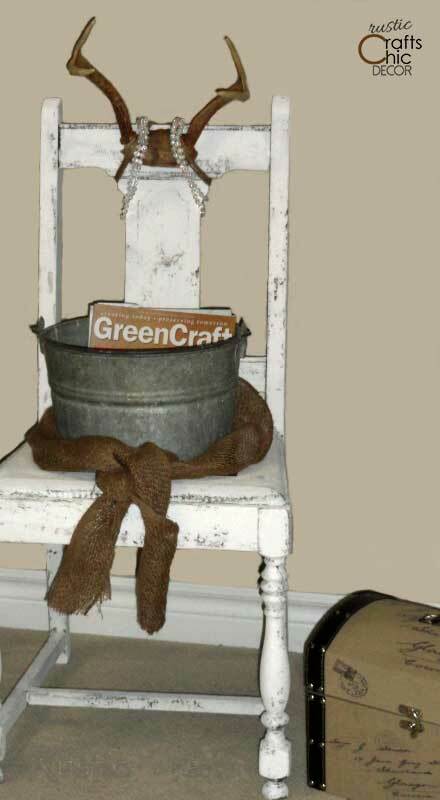 Now, instead of using the chair as a seat, it is used to hold a bucket and magazines. I wasn’t sure how my husband would feel about a set of his antlers draped with faux pearls but he got kind of a kick out of it …I think. He did think that it looked a bit like a torture chair at first until I explained that it was no longer an actual chair but a decorative accent to hold magazines! You can see the whole before and after of the chair here. 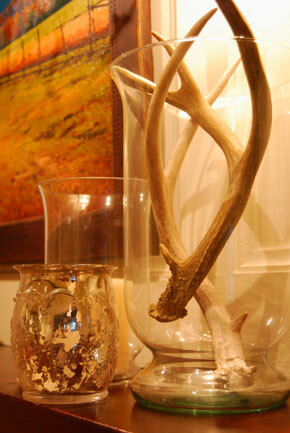 The single antler hugging the picture frame is typically the way I like to use the antlers. It’s an easy way to add a rustic touch to any decor piece. I have also placed them by lamps, hanging out of a basket, and wrapped around a candy dish. 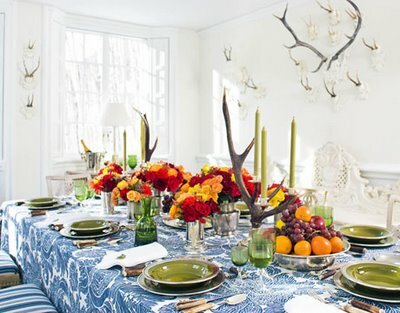 I love how these antlers look against the white walls and the antlers on the table surrounded by all of the colorful flowers looks surprisingly right in place. It must be that nature complements nature! Casa Sugar has an excellent idea for decorating with antlers! The horns look stunning when placed in glass. I can’t believe I hadn’t thought of this before! This is something I will definitely be doing with a couple that I have left. I even already have the perfect hurricane glass! 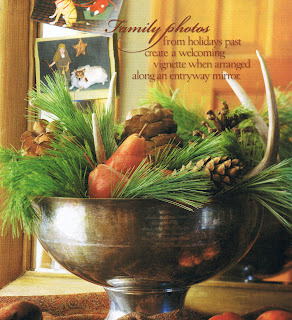 See how rustic and chic this centerpiece bowl looks with the pine, the apples, and the antlers! Cactus Creek Daily had the right idea in mind when coming up with this holiday arrangement. I’m going to need to send my husband out to do more hunting! Oops…..did I say that out loud? It’s okay…I NEED more antlers so that I can paint a set white like this set by Pepper Design Blog. I am loving the contrast with the dark wall. 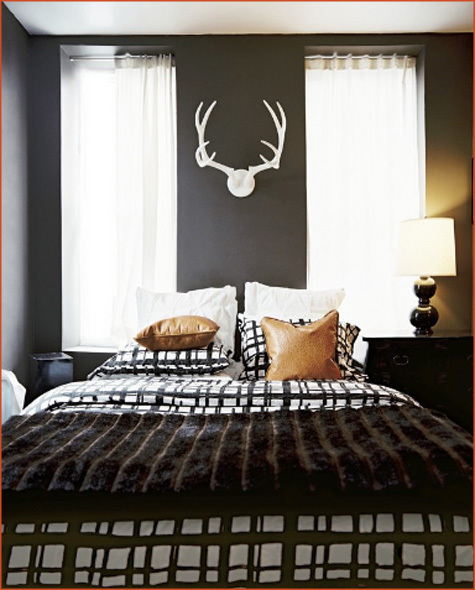 A painted antler adds another fun dimension to decorating with a single antler. These antlers make a decorative way to prop up the rustic shelf, adding so much more to the rustic design at the same time. Have you done any unique decorating with antlers? What do you think of some of these ideas? Leave me your thoughts below…..I love to hear from you! 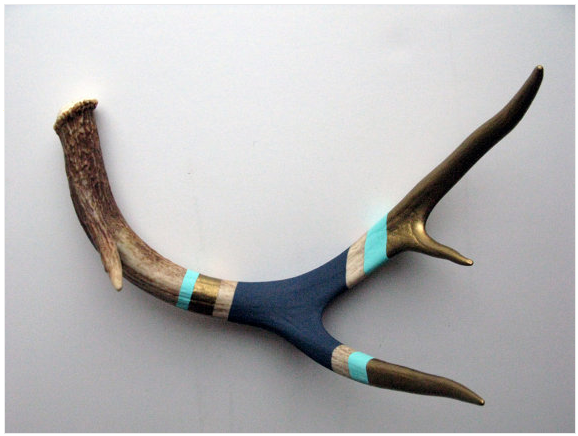 I like how you said that painting an antler helps to add more depth and fun to it. My wife and I are looking for a new light fixture for our living room. 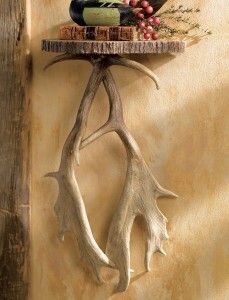 Getting some antler lighting that we have painted or bought would be a great idea! That way we can add a bit of customization while also having the benefit of that rugged style.